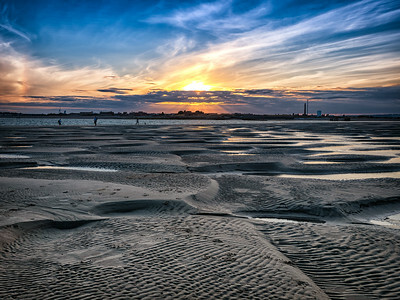 July 2018 Hayling Island, Gunner Point: Low tides coinciding with the sunset exposes the massive East Winner sandbank which stretches for one mile out into the Solent before reaching the channel separating the mainland from the Isle of Wight. 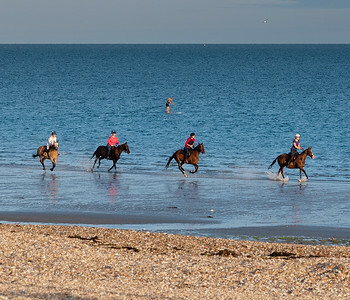 At times like this it attracts walkers, families, dog-walkers and horse riders. 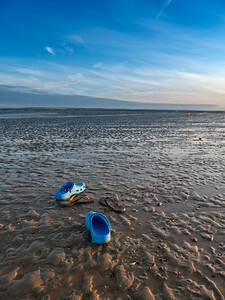 As I walked along the Hayling Beach I came across these two pairs of shoes but no apparent owner. 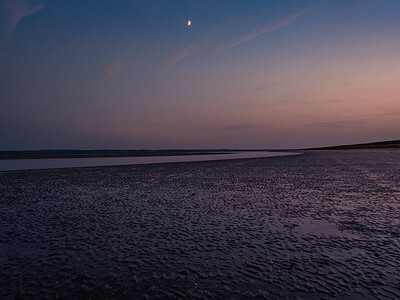 Low tide on Hayling Beact at Gunner Point on the south end of Hayling Island. 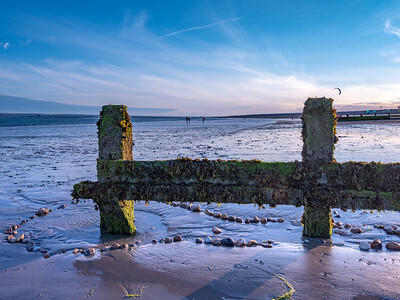 A row of pebbles has been carefully placed to decorate and old groyne, weathered and covered in seaweed. 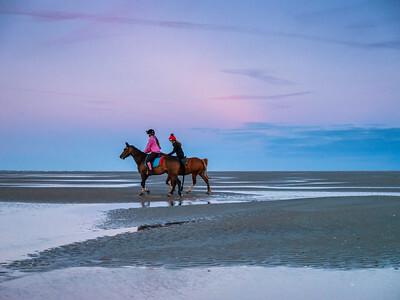 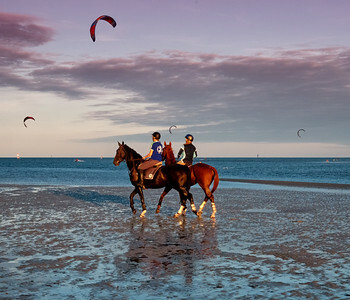 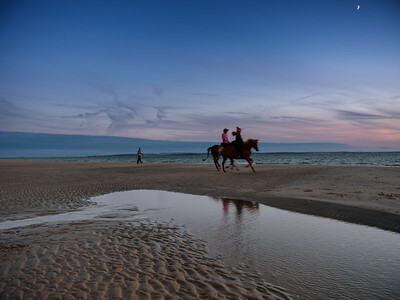 Horse riders at low tide on Hayling Beach. 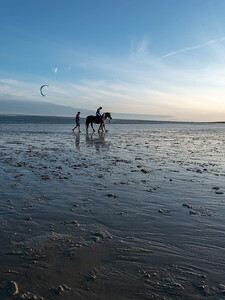 "Horses and Kit Surfers #2"
This photographs gives the best impression of how large this expanse is when the Solent drains and it is exposed. 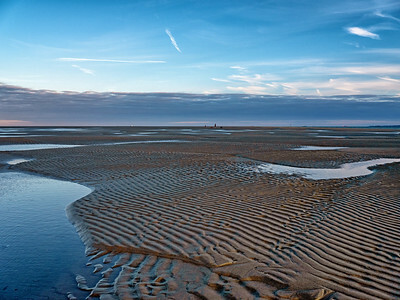 The ribbed sea bed is punctuated by small pools of stranded tidewater. 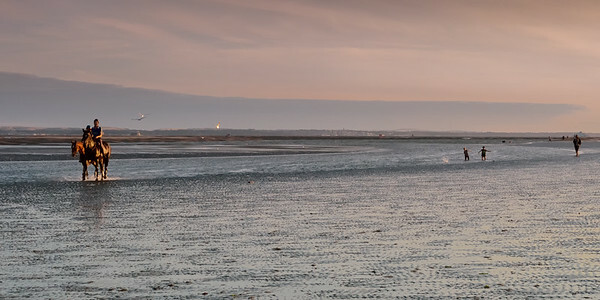 The sun breaks through the low cloud on the horizon creating cathedral light as it sets behind Portsea Island, seen from the East Winner on Hayling Island at low tide. 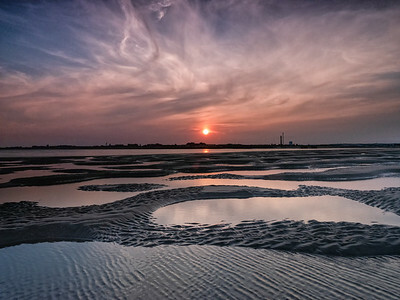 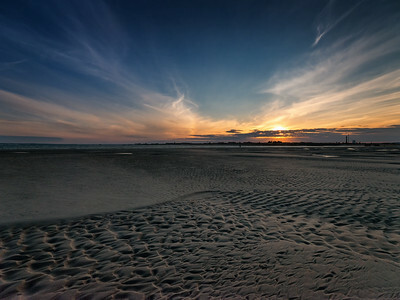 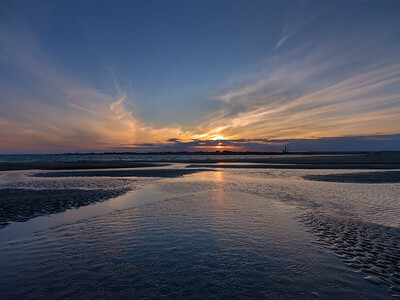 "Tidal Pool, East Winner, Sunset"
As low tide approaches its lowest ebb the pools run stream-like into the channel between Hayling Island and Portsea Island (Portsmouth). 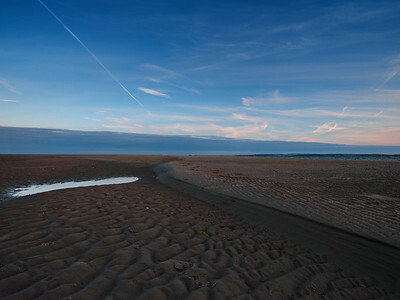 I loved the sensual curve of the seabed which left a winding step across the East Winner at this point. 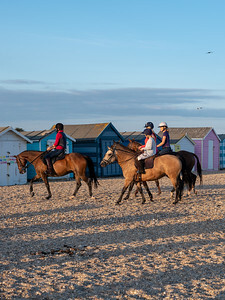 "Ponies and People, East Winner, Hayling Island"
"Homage to Joel Meyerowitz #1"
The American veteran photographer Joel Meyerowitz taught me a lot by reading his recent retrospective, "Where I Find Myself". 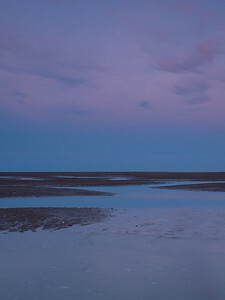 I turned around with the light behind me at sunset and saw this delicate, subtley tinted sky and I was immediately reminded of his seascape work. 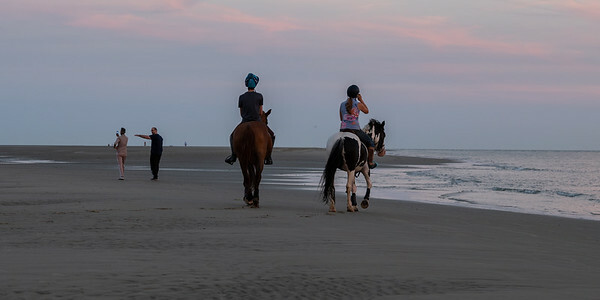 They say imitation is the sincerest form of flattery but I like to think that I was seeing the world for a few seconds through his eyes and a connection was made. 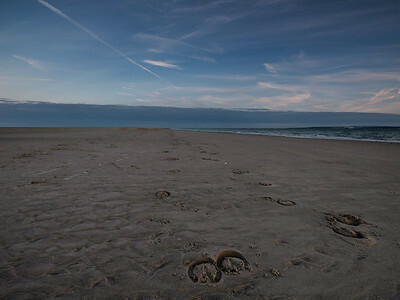 "Homage to Joel Meyerowitz #2"
(Please see previous photograph for an explanation of this title). 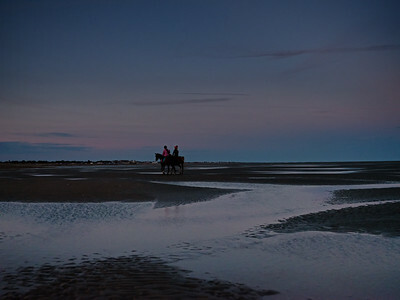 "Sunset, East Winner, Golder Glow"
After sunset, at the start of the blue hour, walkers are still on the East Winner at low tide. 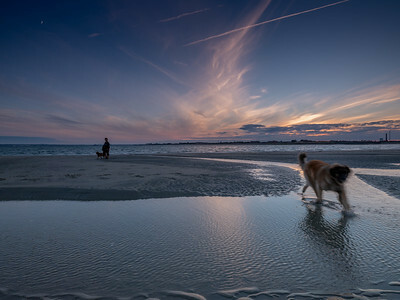 A curious dog comes to check out what I am doing. 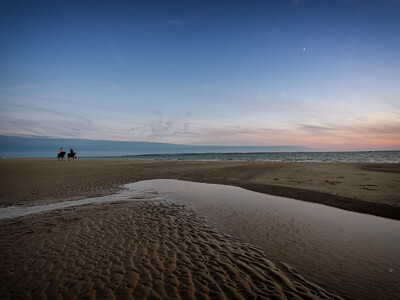 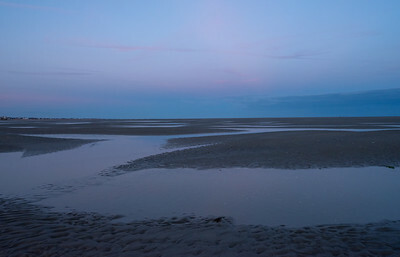 In the subtle post-sunset light before the blue hour begins, the sky turns a subtle shade of pink and is reflected on the surface of beach at low tide.